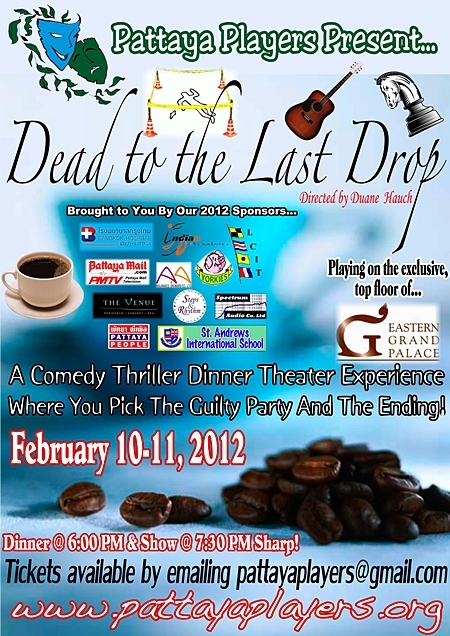 The Pattaya Players amateur dramatics troupe have announced that tickets are now on sale for their latest comedic mystery, “Dead to the Last Drop” playing on February 10-11, 2012 at Eastern Grand Palace Hotel. The play is a hilarious interactive whodunit that takes place in a coffeehouse bookstore called “Café Caffeine.” Members of the audience will be led by the play’s crazy cast of characters through a maze of funny twists and turns. “Dead to the Last Drop” offers a chance for everyone to play a Law & Order/CSI Investigator and question all of the suspects as they perform on stage. Opportunities for audience and cast interaction reach a peak when the audience is allowed to vote on the ending that they want to see! Each night will potentially offer a whole new ending and therefore a completely different story than the night before! Directed by veteran thespian, Duane Hauch, this riotous romp-de-force features an impressive cast and is set “in the round” – offering audience members a unique theatrical experience. This exclusive production marks the beginning of the Pattaya Players’ 5th year of performances and promises to kick off 2012 with enchantment, innovation and mystery! “Dead to the Last Drop” will play on the elite top floor of Eastern Grand Palace, with a picturesque, panoramic sky-view of the city. Dinner service will begin at 6:00 p.m. and the show will commence immediately at 7:30 p.m. Tickets are 1,000 baht per person and include an all-you-can-eat buffet along with the show.